"Do you own your DNA?" 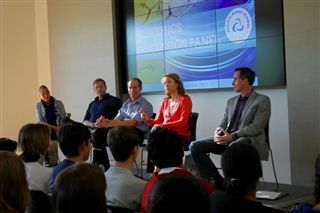 Dr. Laura Rivard, adjunct professor at the University of San Diego, asked ninth-grade biology students on May 19. The question got students and faculty thinking. Dr. Rivard was part of a bioethics panel featuring Dr. Art Levin, Executive Vice President of Research and Development at Avidity Biosciences; Dr. Sam Nummela, Assistant Project Scientist, Cortical Systems and Behavior Lab at UCSD; Dr. Kirk Malloy, Life Sciences, Applied Genomics & Biotechnology Executive; and Dr. Christina Waters, President/CEO Rare Science, Inc. The panel focused on controversial topics in biotechnology, including the price of developing pharmaceuticals, stem cell research, working with animals and genome sequencing. The discussion capped off a unit on bioethics and biotechnology. Afterwards, students gave short presentations on topics of their choice within the realm of bioethics.